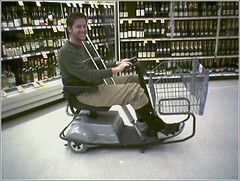 Good news though is that I do not need surgery, and more importantly that I got to use that little automated cart at the grocery store last night! The cart moves along pretty well and the battery lasted the whole time we were there, but my chief complaint is that it didn’t move fast enough for my taste and that I had a hard time reaching some of the stuff on the top shelf! As for my ankle, I’m in this walking boot for a few weeks and going to physical therapy three times a week. BUT NOT CRUTCHES! Good to become visiting your site again, it has been months for me. This write-up that ive been waited for so lengthy. I want this write-up to accomplish my assignment within the college, and contains identical subject together with your post. Thanks, great share.